Experts say it is believed to date from the third or fourth century B.C. DORCHESTER, England (CNN) -- Englishman John Webber thought nothing of the small, shiny cup, passed down from his junk dealer grandfather and stashed under a bed for years, until appraisers said it was an ancient Persian artifact. The ancient Persian gold cup, thought to date from the third or fourth century B.C., fetched $100,000 at auction. The 5½-inch gold cup, which experts have dated to the third or fourth century B.C., fetched $100,000 at an auction in Dorchester, southern England, Thursday. The identity of the winning bidder wasn't immediately known. The relic features the double faced ancient Roman god Janus, the god of gates and doors who always looked to both the future and past and is often associated with beginnings and endings. 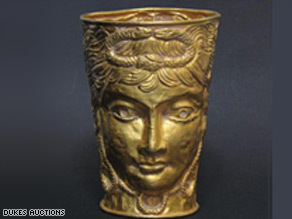 The cup has two faces with braided hair and entwined snake ornaments at the forehead. Webber's grandfather, William Sparks, was a rag and bone man, the British term for a junk dealer, Duke's said, who established the iron merchants Sparks and Son in Taunton, Somerset, in southwestern England, in the 1930s. Before he died, Sparks gave the items to Webber, who didn't realize their value, the spokeswoman said. "Because he mainly dealt in brass and bronze, I thought that was what it was made from," Webber told the Bournemouth News and Picture Service. "I put it in a box and forgot about it. Then last year I moved house and took it out to have a look, and I realized it wasn't bronze or brass. "I sent it to the British Museum, and the experts there hadn't seen anything like it before and recommended I had it tested at a laboratory. So I paid quite a bit of money for it to be examined by a lab the museum recommended. And they found the gold dated from the third of fourth century B.C." Webber, who is in his 70s, said he remembers the cup from when he was a small boy. "It's been quite exciting finding out what it was," he told the agency. Webber brought the items to Duke's at the start of the year for potential sale, because he wanted to "realize some money," the auction house spokeswoman said. A spokeswoman for Duke's Auction House, which is selling the cup, said the cup is believed to be from the Archaemenid empire in ancient Persia. The other two items are a second century B.C. round gold mount with a figure, probably of ancient Greek hero Ajax, who besieged Troy, and a decorated gold spoon with an image of a Roman emperor. "He had a good eye for quality over the years," said the spokeswoman, who asked not to be named, "and anything interesting he'd put aside." Scientists analyzed trace elements of a gold sample taken from the cup to determine its age, and analysts from Oxford University concluded that they are consistent with Archaemenid gold and goldsmithing, Duke's said.